For a fantasy danger junkie movie star like Leonardo DiCaprio, extricating yourself out of tight situations like exploding buildings, airborne missiles and crashing cars in a spy thriller like Ridley Scott’s Body Of Lies, is all in a day’s work. Turning up today in a goatee, a playful smile and with his hair slicked down, a laid back Leonardo joked about hand doubles and doing feelings for months in movies, and basically shrugged off the high anxiety of helicopters chasing him down Middle Eastern streets in real time for the film. He also heaped enormous praise on Ridley, in good part for being the best ever bulls**t filter on a set, no kidding. This espionage operative you play in Body Of Lies is a pretty mysterious guy. So what can you let on about Ferris? LEONARDO DICAPRIO: To put it simply, there’s this dilemma that this character has, of where he’s asked consistently to do things he doesn’t believe in, for the betterment of his country and this war on terror. He’s being manipulated by both sides. And so besides this being a great political piece that’s pertinent to this time, it’s this fantastic cat-and-mouse, espionage thriller that works on its own. Did you find out stuff from real spies? LD: I got to talk to some people who worked in that field. But unless you’re talking about the CIA in the context of history and what they’ve done historically, which we are only now starting to learn about, the fact is that it’s shrouded in secrecy. So there is a certain leap of faith that you take with all of this stuff. And it takes on a life of its on. Okay, but what about all the physical ordeals Ferris has to go through, did you do all those stunts yourself? LD: I did most of my own stunts. You mean like dialing up all the time on your cell phone for further instructions on dodging danger? 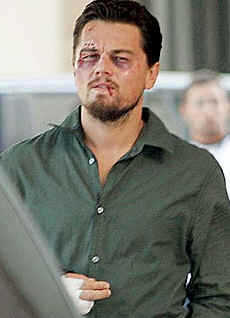 DICAPRIO: That, I didn’t do, I didn’t do any of the dialing! Yeah, I absolutely refused. But we had beautiful hand doubles! And I guess you skipped the finger smashing too. Were the stunts you did really difficult? LD: Yeah, it was difficult. It was a very, very difficult shoot. But that’s the nature of working on a Ridley Scott movie, you have to sort of embrace that. The pace in which he shoots is really intense, really fast-paced, so you have to be prepared for anything at any given moment. And he’ll be like, let’s not do any of that other crap because this is the moment that I am going to choose . Like he literally has helicopters on standby, circling around and ready to get an overhead shot of you running through an entire city. And he’s like okay, why don’t you walk down block and we’re going to have three helicopters chasing you down an Arabic street in real time. Of course, we will block off some traffic, so you’ll be fine, you’ll be great. Okay? You just have to be prepared for that. And that was just the biggest adjustment. I had just come from this other movie, called Revolutionary Road, where it was like doing a 1950s play or something. You know, where we were talking about our feelings for months at a time! Then, I end up in Morocco, with missiles being shot at me. But Ridley’s just this filter, this bulls**t filter. And he trusts his instincts on such a gut level, that it’s great to work with somebody who will say, okay this entire scene is wrong. Let’s get rid of three pages of dialogue, or move this outside. You know, whatever it is, I’m not believing it. Or I am believing it, so push it to the extreme. So it’s amazing to watch him But it was a bizarre transition. Though once you sort of become accustomed to that pace, you would embrace it and enjoy it. And it would start to become this adrenalin fueled work environment that he loved. Oh god, even thinking back, it was tough, but Ridley enjoys that kind of stuff. People always ask me, was it fun? And I don’t know if fun is the operative word. But it was challenging and interesting, and all those other things. But, fun isn’t always the operative word! What was it like to get tortured, even if it was just a movie? LD: It was one of the more complicated scenes. And it was tense, because we knew we had to knock it out of the park. So, I actually got sick after the scene for three days, because there was so much intensity put into that. Did they really blow up that stone house behind you, Leo? LD: Oh, yes, that was a big explosion. What are you memories of working before with Russell Crowe On The Quick and The Dead? LD: He had done Romper Stomper, and I had done Gilbert Grape. So we were both bright-eyed and bushy-tailed! But Russell couldn’t be more professional and more of a normal guy to hang out with. He’s a good pal, he’s great and all that stuff, blah, blah, blah! And he hasn’t changed, and that’s it. And what about getting together with Kate Winslet again, for Revolutionary Road? LD: Kate has remained one of my closest friends, and is the best actress of her generation. We’re these two people in the movie who are basically torn apart. And they feel like they have become cliches of what they’re expected to be like, and have lost their identities. Kate and I basically knew that we could push each other’s buttons, performance-wise. And we knew that we could pull stuff out of each other. I mean, we’ve known each other since we were teenagers. And it was something I felt I wanted the opportunity to do. Do you and Kate get to be lovers? LD: Lovers? Do we play lovers! We play husband and wife. So hopefully, we’re lovers! What have you learned about life, hanging around Hollywood? LD: When I first started out, I had these images of these cliches, of what movie stars are. You know, that they’re egomaniacal pricks and tyrants. But, in general, for the most part they’re nice people, to tell you the truth. Leo, everybody knows about your commitment to the environment, but we’re getting ready for the biggest bailout in economic history. How do you feel about a lot of the money that was earmarked for the environment, that will now be going to save Wall Street executives? LD: If you’re talking about the environment and our country shifting to alternative technologies and ways to power the country, I’ve been profoundly disappointed for years. So it’s no news to me. We should have started eight years ago to be less dependent on foreign oil, and started to invest in some of these new technologies. But we are way behind the curve again, and the United States should be the one to set the example for the rest of the world. Brazil is doing it and other countries are adapting these principals. And the only thing I want in this new election , my new thing, is to say alright, look. Obviously people don’t want other people to tell them how to think or what to believe, or to tell them what’s right politically and what’s wrong. But the only point for me in this election, is I just want enough young people to go out to the polls, and to register and vote. Because then we’ll get a real consensus of what this country needs. We’ll be able to understand where morally our country is. And these young people will dictate policies for the next fifty to a hundred years. So it’s about time we do that. And that’s my only wish, that we get a real representation of the future of this country until the next election. Whoever wins.